The 48th New York Inf. succeeded in following the 6th Connecticut Inf. 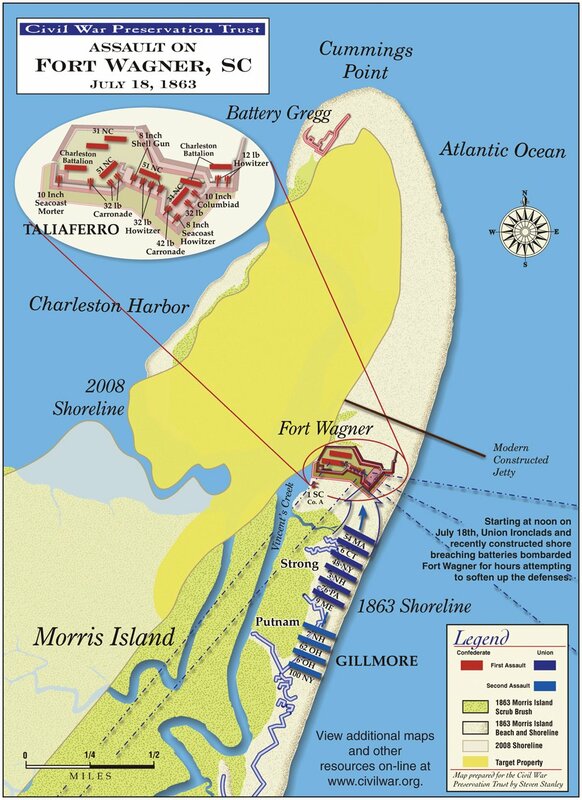 up the slopes of the Southeast Bastion, but only a few of Gen. Strong’s remaining units were able to get that far. Three Confederate Howitzers had come into action on the flanks of the attacking forces, and the deadly hail of canister brought the 3rd New Hampshire, 76th Pennsylvania Zouaves and 9th Maine to a bloody standstill atop a ridge of sand just beyond Wagner’s moat. ‘It was almost impossible to pass over that ridge and live five seconds,’ recalled 76th Pennsylvania Colorbearer Sgt. S.C. Miller. The 3rd NH was in the First Assualt wave and was between the 48 NY and the 76 PA.